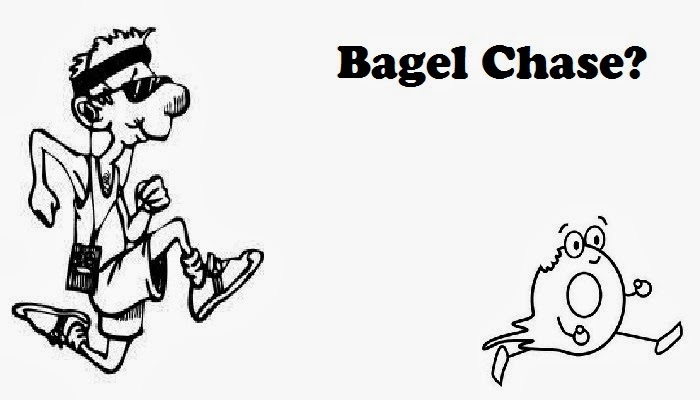 Trail Effect: Bagel Chase 2014! This is a week-long race along a 5km route that goes from Siegal's Bagels, over Burrard bridge to the Cactus Club and back. The main goal is to raise money for the Community First Foundation, but secondary to that is the goal of doing as many laps as you (and your team) can in the week. Last year`s records are 101 laps for a team, 37 for an individual male and 35 for an individual female. Our team consists of me (Chris), Jenna, Heather, Tom, Adrienne and Nick. And our challenge is to blow away all of those records! Though that might not be as easy as it sounds. To do 37 laps in a week we'll have to do an average of 5.3 laps per day, or 5 laps for 5 days and 6 laps for 2 days! That's monstrous!! so we'll see what we can do. Our team name is Laps of Judgement - which may be quite fitting after we've attempted to run 185km in one week! Follow the Trail Effect blog for running updates throughout the week! Or join us on Facebook or follow us on Twitter to get updates automatically!